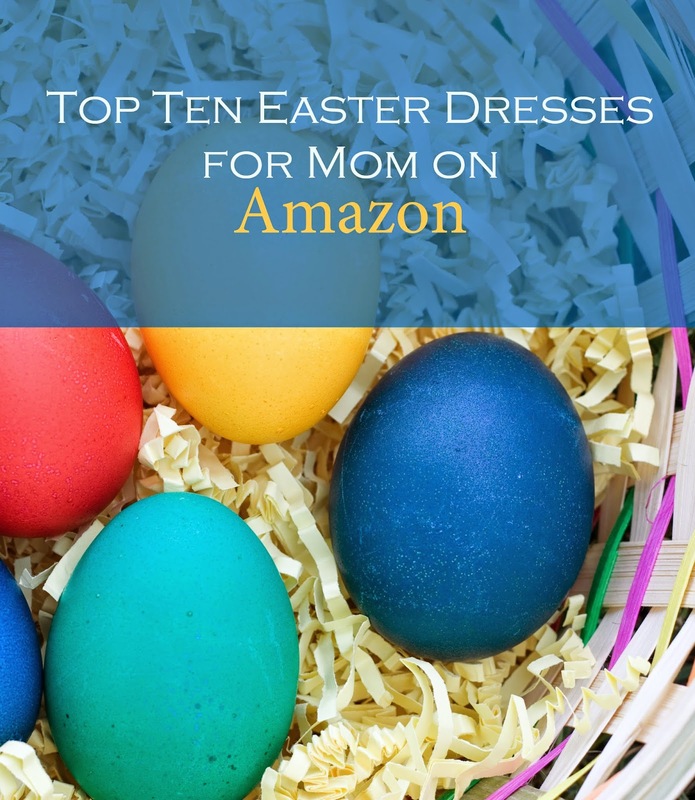 Stylish Stay-At-Home-Mom: You need an Easter dress too! You need an Easter dress too! When I lived in Texas my mother would buy each of us (her five children) gorgeous Easter outfits. They usually involved hats. My sisters and I were always thrilled. We’d twirl for anyone who would give us the time of day at church to show off. The Easter dress ended up being a favorite for the rest of the summer, or until we’d outgrown it. After church we’d pile into the van and find a patch of blue bonnets on the side of the road. My mom would take some pictures and we’d head home to eat egg salad sandwiches and jelly beans. Once I got to high school we stopped getting Easter clothes. Now that I’m a mom, I never think to buy myself anything for Easter. I’m always in need of new church clothes, but it’s just not the same as when I was a kid. So I went searching and I’m posting ten of my most favorite Easter-y dresses for you to choose from. 1. This dress looks so comfortable and easy to wear! Iit’s exactly what I go looking for in a dress – has sleeves, (looks like it) falls to about my knees, and probably won’t show off my cleavage. I would buy this as an Easter dress and then end up wearing it year-round. Beautiful! 2. This dress is GORGEOUS! It has rouching around the middle to hide some flaws, the sleeves are the perfect length, the entire dress falls below the knees (sometimes hard to find) and it comes in tons of different colors. Stunning option for an Easter dress. 3. This beauty comes in a teal, chevron pattern that is really slimming. It’s a maxi-dress making it perfect if you live in a colder climate, or have to chase after toddlers for the day. You could even belt the waist to add some extra pizazz to this easy dress. 4. This dress doesn’t come in a pastel color, but the purple is to die for and it has a bohemian elegance that just screams spring and summer to me. I love it. This is another dress you could wear a belt with to add some glamour. 5. Buy this dress for Easter, and then wear it to work or to a job interview. This peplum dress comes in great colors, and is more professional than the other dresses I’ve shown today. 6. Another dress from Doublju. This dress is also very professional, but would be a gorgeous contrast to the frills you bought for your kids in Easter pictures. The details make it very flattering, and the neckline diminishes a large bustline. 7. This is a beautiful sheath dress that will make you look slimmer through the waist and hips. The panels around the waist will also act like a belt to cinch in your middle. 8. This is a black dress with a floral print. It’s a pencil dress and would look perfect for Easter, but wouldn't be so over the top that you have to stop wearing it as soon as pastels aren't in fashion. 9. If you’re not into dresses, this chevron print maxi skirt would be perfect with a black or white top tucked into the waist band. 10. This skirt only comes in black, but it would look gorgeous with a plain, pastel top. Do you get yourself Easter clothes? What do you look for when you're choosing? I look for something whimsical that I wouldn't necessarily buy any other time of the year, but that I could wear until at least October. That's why I love that first dress so much. I don't really get myself Easter clothes. I should really do it this year so I don't look so plain next to my girls in their fancy dresses this year. I really like the chevron skirt in blue and pink for Easter... But not sure if I could pull it off any other day! Oh I know just what you mean about feeling plain next to your kids! I usually try to look a little Eastery, but never really dress up. I love that skirt too! I don't know about the pink (pink is so not my color haha), but I bet you could totally rock the skirt for the rest of the year. For Easter you could pair it with a light blue shirt, or if you want to go wild do a light pink or yellow and a pretty flowery necklace. Then for the rest of the year tone down the pastels a little. Do a black or white shirt instead. :D I hope you have a GREAT Easter and get to dress up a little. Thanks for commenting! !